M D England and Sons is a full service remodeling company, specializing in basement finishing. 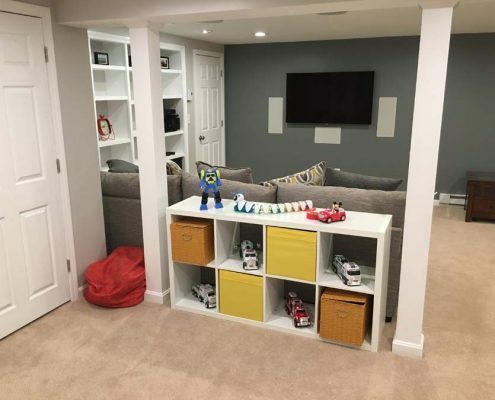 We have been servicing the Metro West and South Shore areas of Massachusetts since 2006, creating hundreds of beautiful basement spaces of all shapes and sizes. Whether you want a simple play space for your children, or an elaborate entertainment space complete with wet bar, full bathroom, fireplace, etc., we can design and build a space to meet your needs and budget. We invite you to peruse our website to meet our team, view some of our previous projects, read what our customers have to say about us, and learn more about the basement quoting and finishing processes. If you’d like contact us for a free, no-obligation design consultation, feel free to call us directly at 774-266-6236 or enter your contact information on the Contact Us page and we’ll get back to you within 24 hours. Thanks!